Even if you’ve seen the trailers and marketing for Pavilion, it’s still a bit difficult to know exactly what you’re getting yourself into. For instance, what exactly is a 4D puzzle game? Well, it’s hard to know for sure what the aptly named developer Visiontrick Media means by that but it seems to be a reference to the M.C. Escher inspired level design and singular, isometric viewpoint. Does that really make it “4D” though? Probably not but it’s a good buzzword. Hair-splitting aside, I’m sure what you’re actually anxious to know is how the game plays. Well, as a puzzler I’m inclined to say it plays pretty well. Though you’ll likely spot a little fellow moving about in some of these screenshots, what you probably won’t realize is that you don’t actually control him at all. Your goal is to guide him from one point to another, clearing the way with your glowing cursor, until he completes the level. What this involves is a combination of ringing bells to signal your nameless charge to travel to a new location, moving platforms to create a path for him, or turning off the lights in an area to stop him from entering it. Despite how odd this might all sound, it’s strangely intuitive in practice, and is even fairly satisfying. Unfortunately, if you’re a puzzle veteran, you won’t find much to stump you here but if you’re just looking for a quick fix to scratch your brain, Pavilion will certainly offer you that. What’s more, the game is incredible to behold. Each of the 23 stages is lovingly curated and beautifully crafted, and if you’re one of those folks who likes to take screenshots in Steam then you might have to make some room. I’m sure we’re all well aware of the cliche at this point of citing the great look and fantastic soundtrack of the latest indie game but credit must be given where credit is due, and Pavilion absolutely nails it in both departments. As mentioned above, there’s a pretty clear connection to M.C. 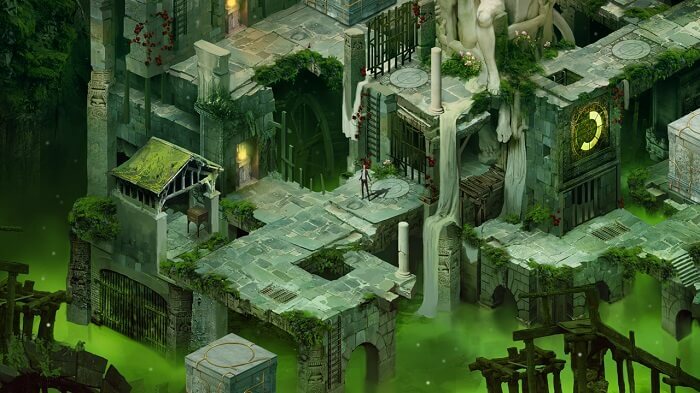 Escher in Pavilion‘s look and design, and fans of his work will no doubt find even more reason to invest in this little experiment. One odd element that’s worth mentioning is that the game seems to be broken into two halves, with the second half arriving as DLC some time this year. What motivated this decision is hard to crack onto exactly, and I won’t speculate on it here, but it is worth noting for those considering purchasing the game. 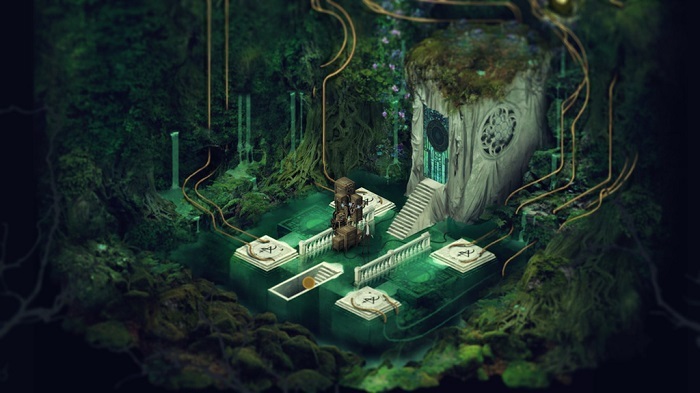 If you’re looking for a gorgeous, breezy puzzler that you can easily wrap up in a weekend (if this game takes you longer than 4 hours to beat, I’m not sure you understand how it works) you could do a lot worse than Pavilion. However, those seeking a more robust experience the likes of which will have them struggling for solutions and returning time and time again with those “a-ha!” moments will not find that here.